There used to be a time when getting a win over Lyoto "The Dragon" Machida meant a lot especially if it was a finish. The former UFC light heavyweight champion started his UFC career 15-0 including a knockout win over Rashad Evans to win the title. But since that win, Machida has only gone 7-8 with his last three fights ending with him getting finished. Anders (-310) is the decided favourite here for a good reason. The up-and-comer is undefeated at 10-0 and is an athletic specimen who can grapple and hit hard. He is also faster, bigger, and stronger. If Machida (+225) is to pull off this upset, he'll have to dig deep and find a way to outsmart the former linebacker. This is the end of the line for Machida and he'll have to prove he isn't just a stepping stone for prospects like Anders. Like the previous main event featuring Brazilian and American middleweights, oddsmakers strongly believe this fight ends in a finish (-400). Anders has finished seven of his ten wins with six of them coming via punches and over half of Machida's bouts (wins or losses) have come via finish. Machida is 39-years-old and is coming back too soon from a vicious knockout loss to Derek Brunson. The Brazilian was coming back from a two-year layoff from his USADA suspension and he is winless since the drug-testing has started in 2015. But even before USADA, Machida's durability has never been good. He is also winless against southpaws and younger fighters in his most recent bouts: both of which Anders is. Anders's only disadvantage here is his experience. He only has one notable win: a KO over Rafael Natal in his UFC debut. Anders's left hand is explosive and one shot could hurt anyone. Most importantly, he has enough explosiveness and wrestling to keep the fight standing. While all signs point to an Anders KO, Machida still has the same skills and smarts as before. As a karate-based fighter, Machida is hard to hit and is an effective counter-striker. Despite not being a power puncher, Machida's precision is deadly and he can hurt Anders if he catches him at any point. 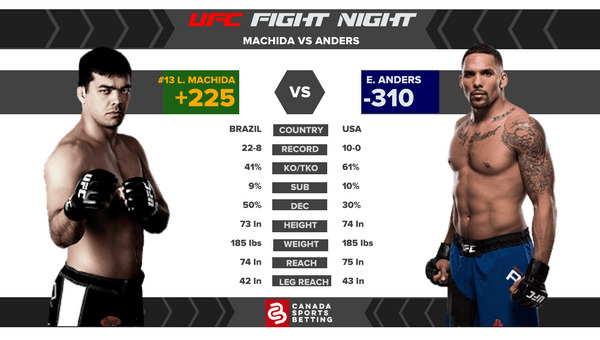 Prediction: With all that said, bank on Anders to knock Machida out within the first three rounds. As elusive as Machida is, all it takes is for Anders to touch his chin and he should go down. Anders will finish Machida via ground-and-pound and put a cap on the Brazilian's once-legendary UFC career. Lock it Up! For Thiago Santos (-335) who will light up Anthony Smith (+240). Santos is the superior striker in terms of power, technique, and speed. Smith is incredibly durable but absorbs a lot of damage. While he's always dangerous especially late in the fight, Santos is just too fast and too good. Who's A Good Dog? Although he is coming off a loss, Timothy Johnson (+130) can still outwrestle Marcelo Golm (-165). Johnson is the bigger fighter and the better wrestler. He can win this fight by neutralizing the Brazilian on the mat. Just Say No: to Deiveson Figueiredo (-165) versus Joseph Morales (+130); these guys are scrappers and while Figueiredo should win this, his exciting style may lead a to a back-and-forth that could go either way. Pass and enjoy it as a fan. The only thing better than picking fights right is winning money along with it. Canadian UFC and MMA fans turn to these Canadian-friendly sportsbooks, to get all their wagering needs. Read our reviews and find the right sportsbook for you.